Home > Electrical, Maintenance & Cable Management > Equipment Marking Labels Signs and Tags > Equipment Inspection and Status Tags > Calibration record tag. Items per quantity: Packs of 10 tags. 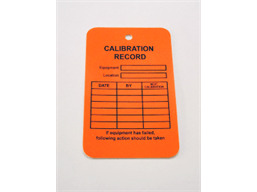 Calibration record tag, for equipment, machinery and plant. Semi-rigid plastic. Suitable for indoor and outdoor use. Waterproof. Easy write on surface. Supplied in packs of 10 tags. 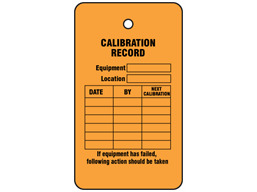 Calibration record tag. Material semi-rigid plastic. Size 130mm x 75mm. Tag to record inspection details on equipment, machinery and plant. Supplied in packs of 10 tags.